Cary, IL – Driving Route 14 in McHenry County’s Cary, IL is anything but serene, yet turn into The Hollows, McHenry County Conservation District’s 338 acre site just east of Route 31, and you’ll find a nature lover’s oasis. 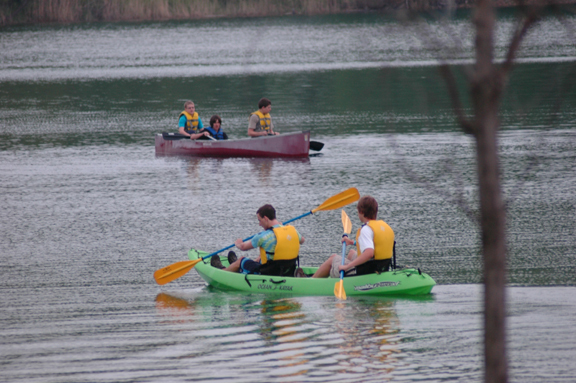 “Lake Atwood is one of the best features of The Hollows and makes it an ideal place for beginner paddlers or experienced paddlers alike,” said Andy Talley Education Program Coordinator for the District. This 20-acre self-contained artificial lake with boat ramp, fishing dock, picnic shelter and amenities includes a 1/2 acre of shallow, sandy-bottomed water and an area where the District hosted its yearly Paddle in the Park program on Saturday, May 21. Open to paddling enthusiasts of all ages the program provided multiple opportunities to learn about the sport. 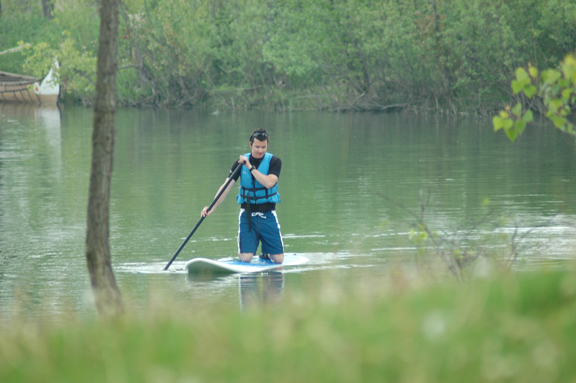 “Lake Atwood has calm, crystal clear water and it is small enough to be safe for beginners, but big enough to get some exercise and practice your paddling techniques,” described Mr. Talley. 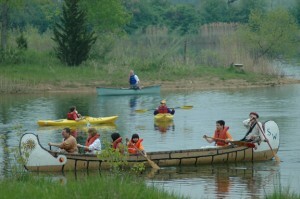 Local paddle sport retailers and outfitters offered canoes and kayak clinics, and test paddles of a variety of boats and equipment. 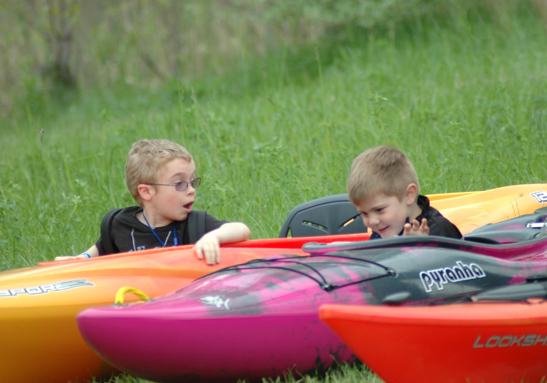 Participants included Richmond’s 2k Adventure Gear, Hoffman Estates’ Cabelas, Woodstock’s Capsurz – Windproof Your Cap, Richmond’s Flatwater Canoe and Kayak Rental, Lakemoor’s BK Boat n Sleds, Kayak Chicago. 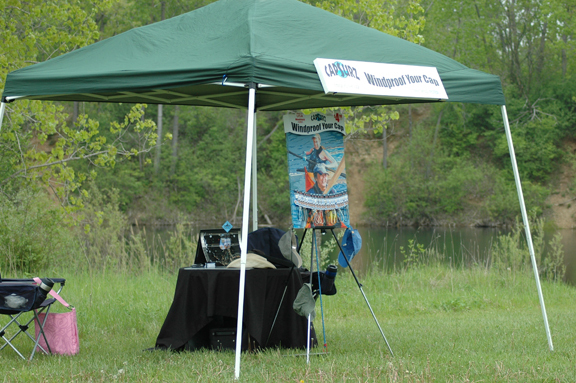 Paddling organizations and clubs were on hand, too, with information on where to paddle, conservation and safety tips, and upcoming adventure trips. Explore more information at Illinois Paddling Council, Boone County Conservation District, Crystal Lake Rowing Club, Prairie State Canoeists, Chicago Kayak Club, Southwest Brigade, and Prairie Coast Paddlers. An intermittent, soft rain complimented the day’s overcast skies. 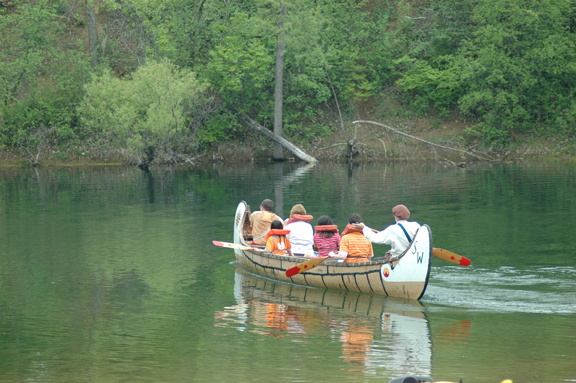 Crystal Lake’s Duke’s Alehouse and Kitchen single-handedly nourished the masses that, dining beneath the picnic shelter, had clear view of the canoeists and kayakers enjoying Lake Atwood and the colorful charm of a voyager canoe. 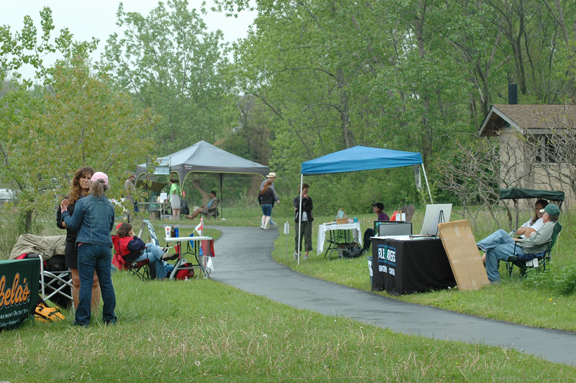 People interested in finding out more about the McHenry County Conservation District should visit www.mccdistrict.org.